The comedy sci-fi franchise returns after a ten-year hiatus, with the same formula of respectably funny wisecracks and obsessively detailed space monsters. Will Smith and Tommy Lee Jones reprise their roles as secret agents who monitor extraterrestrial visitors to earth, though Jones gets relatively little screen time; the story has Smith traveling to the year 1969 to prevent his partner (played as a younger man by Josh Brolin) from being zapped by an escaped convict (with clusters of little fingers knitting together around his eye sockets, in the palms of his hands, etc). As in most successful fantasy blockbusters, there's a comfortable balance between technological wizardry and human talent—for all the eye-popping special effects, one of the chief pleasures here is Brolin's impeccable mimicry of Jones's weary West Texas drawl. Barry Sonnenfeld directed; with Emma Thompson, Jemaine Clement, and Bill Hader as Andy Warhol. 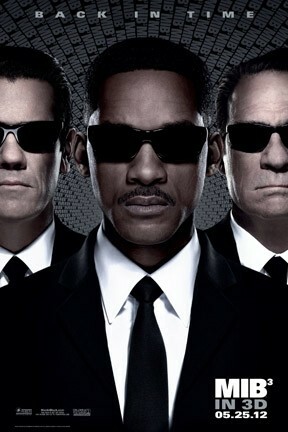 Men in Black 3 3D, Men in Black 3: An IMAX 3D Experience and Men in Black 3 are not showing in any theaters in the area.